The Toll Roads have teamed up with Albertsons to make opening a FasTrak® account even more convenient and accessible for Southern California drivers. FasTrak transponders are now available at 30 of Albertsons’ Orange County retail locations and come with up to $9 in free tolls. Customers can open a new FasTrak account with The Toll Roads and get a transponder at participating Albertsons Orange County stores for $36. Once the transponder is activated on thetollroads.com, $40 in prepaid tolls will be automatically credited to the account. For a limited time, customers will receive an additional $5 in free tolls, amounting to a total of $45 in tolls in their new FasTrak account. As an added bonus, customers who choose to replenish their new FasTrak account using electronic check will be credited a total of $50 in tolls through the holiday season. The promotion is valid through January 14, 2014. 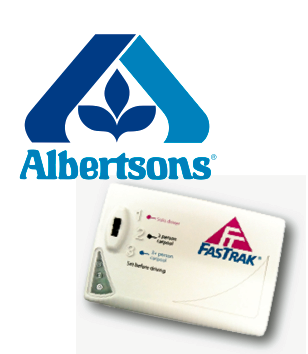 FasTrak transponders are distributed at Albertsons’ service desk. See Albertsons cashier for information on the holiday promotion. Posted on December 4, 2013, in Uncategorized and tagged Albertsons, FasTrak, Free Tolls, Mobility, Orange County, Orange County Mobility, Southern California, Southern California Mobility, TCA, The Toll Roads, tolling, transponder, Transportation Corridor Agencies. Bookmark the permalink. Leave a comment.